We tend to be on the patriotic side when it comes the the 4th of July. During World War II, over 200 UCLA students went off to war and never returned. Some died at Normandy, some at Pearl Harbor, some in POW camps. In fact, UCLA was represented in just about every area and every aspect of that war. Two were student body presidents. So we thought we would take a moment and honor a few of our Bruin heroes from that time. Francis Wai – UCLA’s first Congressional Medal of Honor recipient and the only Chinese-American recipient of the award, was also a starting quarterback on the 1938 UCLA football team. Wai majored in Economics and participated in four sports while at UCLA. Shortly after graduating, Wai attended Officer Candidate School and was commissioned as one of the first Asian-American infantry officers in World War II. Hoisch attended UCLA in 1946 and 1947. While at UCLA he was the star running back on the undefeated 1946 football team. In the 1947 Rose Bowl, Hoisch ran back a kick-off 103 yards which is still the Rose Bowl record for the longest run in its history. Made the All Pacific Coast Team (only Bruin on the team), Honorable Mention All-American, and member of the Rose Bowl Hall of Fame. While these are all great accomplishments, it is what he did BEFORE attending UCLA. During World War II, Hoisch was sent to flying school and ended up logging over 1,500 hours of combat time flying C-46 planes over Burma to supply the British. During that time, he was awarded three Distinguished Flying Crosses, and four air medals. ERNIE CASE, QUARTERBACK, BOMBER PILOT CAPTAIN, AND P.O.W. 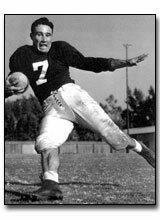 Case was a UCLA sophomore quarterback in 1941, left to serve his country during the war, and returned to lead UCLA to an undefeated season, a win over USC, a Rose Bowl berth, and eventually making it into the UCLA Hall of Fame. However, it is what Case did between those two periods at UCLA that is important. At the ripe age of 22 in 1943, Case was the pilot and captain of a B-26 bomber. On one particular mission, Case was sent to Sardinia to bomb a German Luftwaffe base. Hit by anti-aircraft fire, Case and his crew were forced to parachute out over enemy territory. Soon captured, with multiple broken bones, Case was sent to an Italian POW camp. After seven months, Case was able to escape by getting across two barbed wire fences and slipping into the Italian countryside. After a month on the run, Case finally made it to a Canadian camp. Case received the Purple Heart, two Bronze Stars, and the Air Medal with Oak Leaf Cluster. After his service, Case returned to UCLA, and as they say, the rest is history. While not related to WWII, we would feel remiss if we didn’t mention what UCLA is doing TODAY to help our military. In an effort to help those who have suffered severe injuries while serving in the military, UCLA has embarked on a major program to provide reconstructive surgery in an effort to give these young men a chance at a normal life. UCLA Operation Mend is a groundbreaking program that provides returning military personnel with severe facial and other medical injuries access to the nation’s top plastic and reconstructive surgeons, as well as comprehensive medical and mental-health support for the wounded and their families. We cannot express how appreciative we are of the amazing work of these Bruins. CLICK HERE to see some of the Americans that have, or are, receiving their help. The information for this story was retrieved from numerous sources, including online, yearbooks, and old newspapers. Fantastic story for today. Thanks!